Twin Cities Daily Photo: Which Is More Frightening? When I first read this sign in my Cottage Grove neighborhood I did a double take. Was it because of gas being at $3.65 per gallon? Or was it $2000.00 dollars for a car wash! All right, it does read "unlimited" car washes for $2000 dollars, but still! Perhaps are they forgetting that silly little decimal point and the price is really $19.99? I personally read it as $2000 dollars for a car wash, there has to be others that have thought the same....right? Well the car wash price probably wont be going up every day like the gas price. Oh, No. Now that car wash song is stuck in my head, and there are several of them darn songs! I don't know if you noticed my post from Sunday, but I did a photo of a gas station here, too. If you get a chance, stop by. I am outraged. Yeah i read that as a $2000 car wash too! The price of gas! I can wash my own car, thank you, or just leave it dirty! Gas came down a little. Only to go back up, soon. 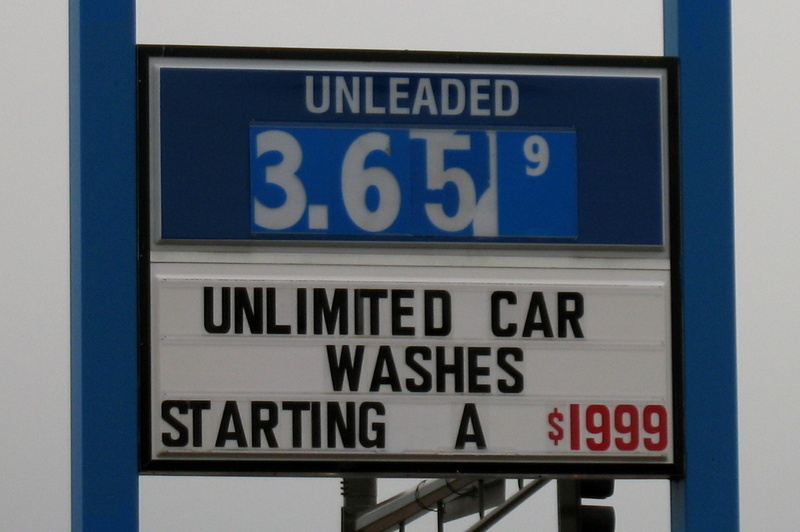 i read that the unlimited car wash is selling for $1999, but at the low end, where I would imagine the premium car was would sell for considerably more than the $1999. I'm confused. But it is late.